point or another feel like they cannot cope with all the mood swings, the pressure and everything that goes with the pregnancy. 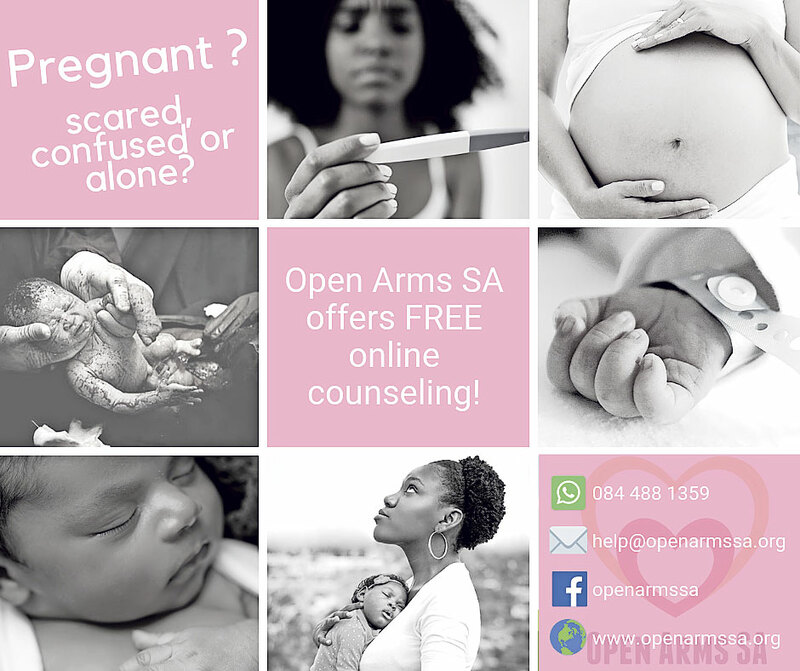 Open Arms SA is an online help desk for pregnant and birth mothers in crisis all over South Africa. It offers mothers to be with emotional support, help and information so that they can make informed decisions for their baby and themselves. Founder of Open Arms SA, Youandi Gilain said, “Open Arms SA is a project of Isiaiah 54, a baby home for abused and abandoned babies. She said there are no walk in as it is an online service. “If a mother decides to give their baby up for adoption, I refer them to one of the amazing social workers I work with, we have very good and close relations, they are amazing and have an amazing heart not only for the babies but also for the mothers. When a baby or child is found abandoned, the matter is reported to the police and a case of abandonment is opened. The baby will be taken to the nearest hospital for a health check and thereafter they are taken to a place of safety or a baby home,” said Gilain. She added that the police and social workers work together, to trace the mother and or family and if the family is found, able and willing to care for baby, it is fortunate, if not, the baby can then be put up for adoption. “If mothers feel they unable to keep their babies and they would like more information they can contact me via whatsapp on 084 488 1359, via email help@openarmssa.org or via facebook Open Arms SA, or have a look on www.openarmsa.org The mothers can also go to their local child welfare, Department of Social Development or crisis pregnancy centre.” said Gilian.